A sight for hungry eyes. Finally, the inevitable has happened. You’ve probably been wondering how many trips to Phoenix it has to take for a food blogger to tackle Pizzeria Bianco and the answer is far too many. 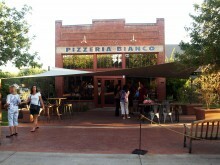 Pizzeria Bianco, for those who are not in the know, has regularly been recognized as the greatest pizza in the country and that is no small claim, especially considering we are talking Phoenix here and not New York or Chicago. With that title, as expected, the place is nearly impossible to get a seat at, at least during normal eating hours. During abnormal hours, like 4:45 on a Thursday afternoon, things are a little different and we found multiple open tables and took one for ourselves.